“Show it, don’t tell it” is probably the most frequently quoted screenwriting advice (though you’ll hear it for novels and short stories too). And at its heart, yes it’s good stuff: OF COURSE we want to “show” our viewers and readers things; OF COURSE we don’t want to be “on the nose”, but use subtext instead; and OF COURSE we want to be thought of as “good” writers. Durr. 1. … The phrase has become redundant and/or unhelpful. Anyone who has spent even five minutes browsing the web about writing (never mind attended a course or written something) has heard the advice, “show it, don’t tell it”. Just about every writer thinks s/he knows what it means … and that it DOESN’T apply to *their* work. I’ve lost count of the number of writers who have come to me complaining someone has recommended “show it, don’t tell it” to them – WTF? They’re not a newbie, y’know! 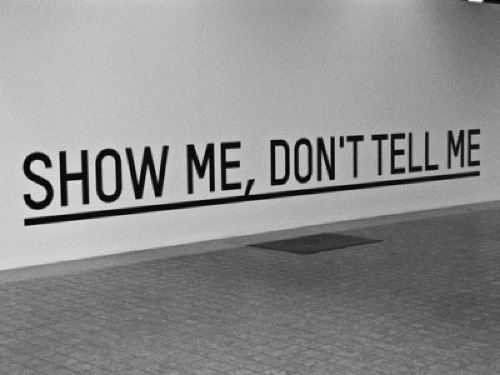 “Show it don’t tell it” has become synonymous with “bad writing”. Of course no writer is willing to believe their writing is “bad”, thus anyone who recommends this supposed advice must be “wrong”. Basically, script readers, screenwriting tutors and article writers have given out this advice so often, the phrase itself has in essence become a shorthand way of saying, “start again”. This is not helpful, especially when writers aren’t sure *which* bits are problematic. What’s more, arguably “show it, don’t tell it” has become a “get out of jail free” card for poor feedback-givers who simply can’t be bothered to break a work’s problems down. More on this, next. KELLY: Make sure you swing by the shop and get some milk. DAVID: I don’t have any money on me; I left my wallet at home. I can’t believe it; I’d forget my head if it wasn’t screwed on at the moment. I’m so stressed ‘cos of this presentation at work. My boss is looking to fire people. KELLY: It’s okay, I went to school with Cheryl, the woman who works there; she’s the assistant manager. She’ll let you have it, just make sure you pay her next time you see her. The above example “tells it” far too much because first off, we probably don’t need to know Kelly and David need milk anyway. If it’s not part of the “direct” story, then it is extraneous. We get the feeling they’re talking about the milk just so David can tell us he’s feeling stressed; also, we suspect maybe we’re hearing about Cheryl because she will figure somewhere in the story next. No thanks! So: CHOP, CHOP. PAUL: Why do you drink too much? KEITH: I started drinking when I was fourteen. Looking back now, I see it was to numb the pain. My parents never cared about me and were always working. There was this one guy who supposedly took an interest, but he was grooming me. Before I knew it, he was abusing me. I couldn’t tell anyone; I felt too ashamed. The abuse stopped when I left home, but I never went back. My parents never got why. Now I have my own son I live in fear of it happening to him. The above will happen in genre screenplays, but especially in personal dramas and YA novels. In other words, characters will name their pain very obviously, maybe even returning to it over and over, with various other characters facilitating this by asking them questions about how they feel. – A dedicated character whose job it is, sometimes literally, to facilitate the lead’s emotions: this especially happens in the case of doctor, counsellor or therapist characters, but also best friend and mentor characters, plus wives/girlfriends. – An “overtelling” via some kind of “back story as prologue” (especially a traumatic event) before the story “really” begins in order to set up the main character, especially one that is otherwise standoffish or isolationist. – In screenplays, a reliance on scene description that is too detailed, in the mistaken belief these random objects – frequently photos or jewellery, but also mementos of trips to the seaside like shells and stones – will give us a supposedly visual insight into a character’s mindset or motivations. Frequently these will join up with that “overtelling” of that traumatic event mentioned previously. In the case of novels, a tendency to overly describe various tiny details (especially weather, but also the rooms characters are in) may also create a similar problem. – A reliance on a character with a special need that means other characters need to speak for them (for whatever reason, but especially via sign language or a because another character cannot speak English). This may mean potential jeopardy or tension in the scene is lost because too much “translating” is going on. … And the list goes on. As you can see, merely saying “show it, don’t tell it” to a writer is not very illuminating. They need it broken down by a script reader or editor WHERE the problematic areas are; WHY they present a particular issue in the story that is being told and WHAT they might want to consider by way of tackling them. 3.) … Sometimes you NEED to tell! Any form of creative writing, whether screenwriting, novel or short story, needs a sense of balance. This means that a) yes you need visuals b) yes you need subtext but c) yes you need to be OVERT at times, too! Whilst it’s obviously not desirable to have characters saying exactly what they mean all the time, or handling weird and random objects, or naming their pain with pinpoint accuracy, occasionally a well-timed moment of dialogue and/or action that underlines its deeper meaning work BRILLIANTLY. What’s more, it’s typically these moments that get remembered, because they have the ability to take the reader or viewer’s breath away. The key is knowing when these moments can work and why – and not overdoing it. Yet so many writers (and script readers and editors) have swallowed “show it, don’t tell it” WHOLE, which means these potentially devastating and/or amazing moments of raw truth or emotion get chopped. Such a shame. So, next time someone gives the feedback “show it, don’t tell it” — TAKE A DEEP BREATH. Could the reader mean one of the problems listed above? Could you be trying too hard with subtext; overtelling back story; or having your characters say too much? Or could the reader have jumped the gun on that notion of “raw truth/emotion”? It’s your work. You decide. Hi This post doesn’t apply to me right? Watch any current BBC/ITV drama. They are crammed full of “Tell for God’s sake it’s quicker” moments. Mother: What’s wrong with him? Doctor: It’s a routine case of expositional dialogue. Mother: Why are you doing that? Doctor: So the viewer knows how important it is to get these facts across quickly – besides it’s time for me to shag a nurse in the broom cupboard. Mother: Why are you closing the curtains? Nurse: We always do that on TV hospital dramas. Budget cuts at the Beeb mean we can’t afford to pay the actors to lie in bed when they are not actually acting. Computer Screen full of every single piece of backstory needed to set the plot up. Here’s a good example for number 3: when being overt works. And here’s another, from the end of The Dark Knight Rises (yes, yes Lucy: a superhero movie) so beware of spoilers. It helps that it’s Michael Caine delivering the line. The rule “Show, don’t Tell” is still highly needed, in my opinion, but it should be changed to “Dramatise, don’t Tell”. The writers I have helped in the past struggle to identify which parts of their stories are the most important elements, so they ‘tell’ the reader what happens rather than ‘dramatising’ the scene. For instance, a writer might write “David returned home to face another argument with his wife, and immediately stormed out to find a bar.” This is fine if the argument is not relevant to the plot (yet I would argue that if it’s not relevant, then cut it! ), but if it is, then the scene needs to be dramatised – the reader needs to ‘see’ what happened and ‘hear’ that argument in the form of dialogue. Absolutely Mark, many of the writers I deal with need this advice, but “Show it, don’t tell it” does little to illuminate them on what they *need* to do. “Dramatise, don’t tell” is far more helpful, IMHO. Yes of course; no one wants that. My point is, simply saying “show it, don’t tell it” is not necessarily illuminating. What a difference a change of word can bring to your understanding, dramatize as opposed to show. “Create to relate” is awesome, love it! Great post – I’ve always been told “Show, don’t tell” by various people since I started writing and the other being: “Tell the story without any dialogue” but sometimes a zinger of a line delivers punch and emotion along with the action. What would be a great would be an example of how to do point 2 between Paul & Keith without so much “on the nose” dialogue? Would you do it slowly over a couple of scenes, revealing Keith’s past and his fears for his son? Just wondering! Thanks!! My favourite ever exposition scene ever ever ever is Bubs in The Wire – they’re looking at the photos of the hat scene, and he’s explaining who everyone is to the detectives. Helps the audience get a visual on the basic structure of the drug sellers’ organisation, as well as check the faces, as well as motivating us to remember them, as well as simply telling because they’ve got a huge cast to get set up as well as setting up Bubs as an amazing character. Though.. I do realise that the police station wall covered in pictures and string is a bit of a worn trope. Do they even have these? Nevertheless, works like a charm in The Wire and I didn’t pin it as exposition on first watching: it was too entertaining. Entertaining is a low goal in some ways – but it’s also a GIVEN. So much theory forgets to mention entertaining the watcher/reader. The above extract is the beginning of a short story that I’ve recently been working on. I think parsing it might add something to the debate here. So right at the start of this story, the reader’s aren’t simply finding things out about Joan and her world they are investing emotionally in her psychology and predicament. The reader becomes an active part of Joan’s world not simply a passive observer of it. “Telling” writing turns readers into passive observers, writing that avoids “telling” turns them into active participants. That’s what we should be aiming for, it’s what “show don’t tell” really means. Thank you SO MUCH for this article!!!! I am writing my first novel, part 1 of a fantasy and historical fiction saga with characters that live in different eras, and several individual stories (kinda like short tales) that merge into a greater, general story. And I have had so much trouble regarding in what order I should tell those small stories so that the plot is better understood, and defining what story is the main one, and what stories should be shortened. I received the advice to “show don’t tell” in some parts where my editor thinks I’m excessively describing things in certain stories that are not important for the main plot, and I didn’t understand half what he told me to change, or why to do it….until I read this. Now I understand what are my exact problems. Thank you again! Action is harder than words but to just say, “show not tell” and not show how not to just tell is unproductive. Hi, Marta. I think that I sort’a just did that in my comment. Did you read it? I completely agree with you that those who scatter gun that sort of advice about without providing concrete examples of how to do it are much less than helpful, by the way.